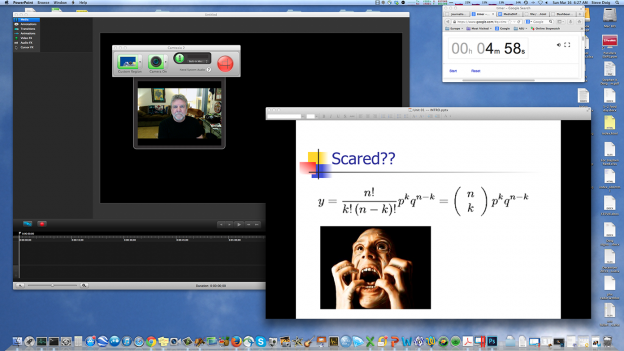 Stephen Doig uses a screen capture software to record his lectures. As it turns out, you don’t need Muppets to teach a good online course. A puppet from the Harvard EdX online course. To my surprise, the discussion board turned out to be lively, engaging and a lot of fun -- for me included. I worried about this a few months ago as I began to prepare for my Arizona State University ASUonline “Media Research Methods” class. This concern blossomed when, out of curiosity, I signed up for a Harvard EdX online course on computer science basics and watched the first lecture. 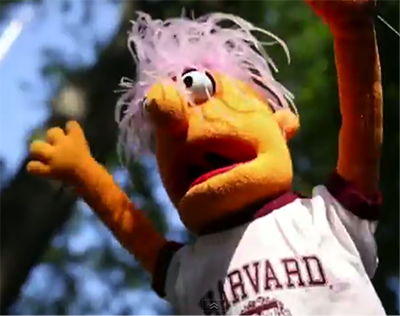 The video began with a two-and-a-half minute segment of a fuzzy puppet waking up in a dorm room and then rushing across the Harvard Yard to get to this class. It wasn’t some generic puppet — it was a Muppet; apparently the dorm is around the corner from Sesame Street. And the rock-star lecture was delivered from the stage of what looked like a packed opera house, complete with props, multiple camera angles, wireless mikes and professional editing. My virtual classroom, on the other hand, was my home office, with me sitting in front of my iMac’s built-in camera talking into a cheap microphone. The contrast just shows, I guess, what that $60,000 a year buys those Harvard kids. But I shook off my feelings of inferiority, completed my class materials and recorded my 24 lectures. Now that the seven-week course is over, I have learned a few things to share with any of you who might be considering teaching online, too. Based on experience from my own (ahem) checkered undergrad days, I know that rigid deadlines help most students to stay on track in a course. I had previously taught this course, which is focused on statistical literacy for journalists, as a lecture class in person. Back then, after each class there was a quiz on the material that had to be completed before the next class begins. But students taking online classes often are working full-time jobs, living in time zones across the world, or have family responsibilities that make such a rigid schedule difficult to meet. To balance these competing demands of enforced progress and flexible scheduling, I organized the class so that each week there were three to four lectures, chapters and quizzes to complete. But only one deadline — all of the week’s work had to be submitted online by 6 a.m. Arizona time each Monday of the following week. When they chose to do the work was up to them. Some students spaced it out over the course of each week. Others did it all on Sunday — or sometimes into the wee hours of Monday. I made it very clear in my syllabus that no excuses — last-minute computer crashes, pets eating homework, alien abductions, whatever — would be accepted for missing the weekly deadline; after all, I told them, they had all week to do the work. Just like it is easier to write long than to write tight, it takes a lot of thought to limit an online lecture to an effective duration. The typical in-person course is built around 50- or 90-minute classroom sessions, but I knew that a considerable portion of that time is spent on more than just the instructor droning on from lecture notes — questions, discussion, demonstration and such. 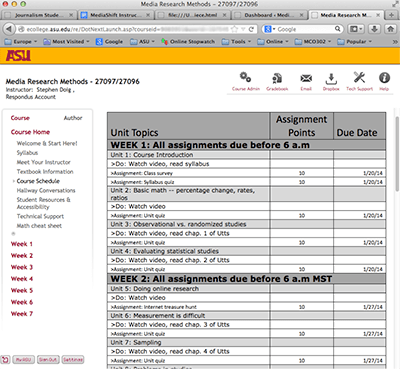 ASU offers its online instructors a lot of support and research on best practices in teaching such courses. One of the key recommendations was to limit video lectures to about 15 minutes. The reason is that attention wanders when content is being delivered in one direction — teacher to student — without any other interaction. Better several short talks focused on one concept than one long one that tries to cover several topics. To adapt to the time limits of online teaching, I had to ruthlessly pare my slides to the essence of the objective I wanted each lesson to deliver. I could do this because I designed the course around a textbook (“Seeing Through Statistics — 4th Edition”, by Jessica Utts) in which each chapter was the focus of the corresponding lecture. In my syllabus, I told students that they were responsible not only for what I said in a lecture, but also any other material that was discussed in the companion chapter. This actually worked quite well. The lectures highlighted the concepts I wanted the students to learn, and they could find additional explanation and examples in the text, as well as questions and exercises at the end of each chapter. It certainly would be possible to do the same thing without a textbook, but I would strongly recommend supplying handouts, tipsheets, practice exercises and other supplemental reading to go along with each lecture. ASU has a video studio that some online instructors use for recording their lectures, but arranging studio time seemed like a hassle to me. Instead, I bought a $99 screencapture package called Camtasia 2 for Mac, which allowed me to record my lectures at home on my own schedule. (Plenty of other choices exist, including Quicktime Pro and Screenflow.) With Camtasia, I could record my PowerPoint slides in a window, and at the same time my image as I talked into my webcam was displayed in a small box in a bottom corner of the slides. Camtasia also allows video editing — useful when the phone would ring in the middle of a lecture, for instance. One problem (noted by other Camtasia users, too) was that sometimes the audio would shift increasingly out of synch with the video, making the little box with my face look like a badly dubbed foreign film. I sort of solved the problem by recording an intro with my talking head, then doing the slides with just audio but no little box, and then closing with another talking head shot reminding them to do the quiz. I’d then splice these together with the editing tools. At the end of a lecture, Camtasia would convert it into the widely-used .mp4 video format and I would upload the result into ASU’s servers for the courseware to deliver on demand. Depending on how much motion went on during the lecture, the file sizes were about 150 to 250 MB in size. I designed the course so students could earn up to 500 points. Each chapter quiz was worth 10 points — low stakes so there was less anxiety but enough so that missing a deadline starts to subtract from the final grade. I also had a midterm and a final exam, covering the concepts of each half of the course. These tests were worth 100 points each. And I started the semester with a quiz about the detailed syllabus, an easy 10 points that eliminated later attempts at claiming “Gee, I didn’t know” about class schedules or policies. With 60 students signed up — and there could be as many as 200 — grading all those quizzes and tests could have been drudgery. Instead, I made all the assignments multiple-choice questions that could be automatically graded by ASU’s online courseware. ASU uses Pearson ecollege, but other platforms like Blackboard exist. It also would be possible to use web survey sites like SurveyMonkeyor QuestionPro to build your own quizzes and tests without a big courseware infrastructure. I should add that one of my policies is that all quizzes and exams are open book, open notes, open Internet — and no time limit on completion other than the weekly deadline. As a journalist who does statistical work on occasion, I am more interested in making sure I am correct than in memorization skill. I have a bookcase full of stats and reference books, and I refer to them often when I do that kind of work, and I allow my students to do the same. So does all that make the course so easy that everyone gets an A+? I’ll save that answer to the end. Like clockwork, students begin asking about opportunities for extra points right after the midterm. I suggested in my syllabus that I might offer up to 20 extra points, in the form of some exercise that used class concepts — but no busywork. I did that, with two exercises that most students completed. Another of the strong recommendations from the ASUonline support team was to have a “discussion board” feature built into the class. I was dubious at first, imagining how stilted “discussion” would be if it was just postings from scattered students and responses given perhaps days later. But with some skepticism, I set it up so that students would earn points each week (for a maximum of 50 points through the semester) for posting about some media report of a research study of some kind they had encountered that was relevant to what we were doing in class. To my surprise, the discussion board turned out to be lively, engaging and a lot of fun — for me included. I made sure to check in with it each night and post a sentence or two of my own reaction to each posting; I learned from the evaluations at the end of the course that the students really appreciated knowing that their instructor actually was reading what they were posting. The studies (including links to the original material) that were posted and the comments the students made demonstrated that most actually were becoming critical consumers of media reports — a central goal of the course. The only problem was that a few students would wait until late Sunday night to post, which meant that there would be no chance for others to read and react. But I will address that the next time I do the course by having some sort of point-penalty for last-minute postings. When all the virtual chalk dust had settled and the final exams were in, I evaluated the success of the course. Two students maxed the points; one student flunked, though he apparently quit doing the work for several weeks without formally dropping the course. Overall, about a quarter earned an A, a third were in the B range, another quarter in the C range and the rest limped in with Ds. Was it too easy, or too hard? The so-called curve (a statistical concept in itself) looked pretty good to me. 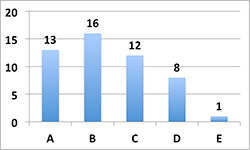 And the strictly anonymous student evaluations that were completed by more than 90% of the students were almost uniformly positive, despite the fact that many of them were from students who didn’t earn As or Bs. As it turned out, I did, too. Steve Doig is the Knight Chair, specializing in data journalism, at ASU’s Cronkite School of Journalism. Before joining ASU in 1996, he spent 20 years at the Miami Herald. His data projects have earned the Pulitzer Prize for Public Service, the Investigative Reporters & Editors Award, the Goldsmith Prize for Investigative Reporting, and the Polk Award for Medical Reporting.